Polished and professional. 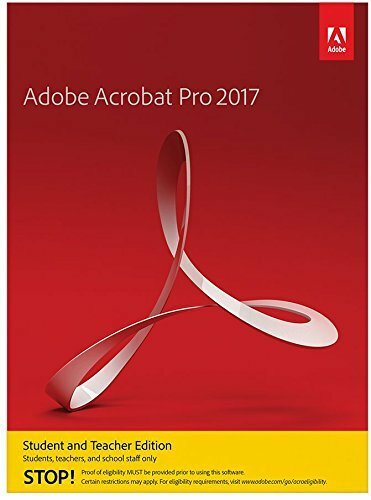 Thats the impression youll makeand the work youll deliverwhen you use the all new Adobe Acrobat Pro 2017 to prepare and share your documents. Get the complete desktop solution for working with PDF documents. From Adobe, the leader in secure digital documents for over 20 years. 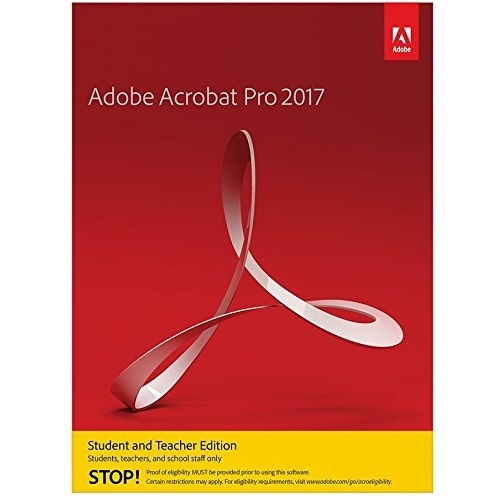 Adobe Student and Teacher Editions are for students, teachers, school staff, and other educators who meet Adobe eligibility guidelines. Proof of eligibility will be required after purchase in order to use the software. WHO CAN PURCHASE AN ADOBE STUDENT/TEACHER EDITION? University and college studentsstudents enrolled at a higher education institution defined as an accredited public or private university or college (including community, junior, or vocational college) that offers courses of study that lead to a diploma, degree, doctorate or certification that is nationally recognised. Students who are younger than 18 and do not have a valid photo ID may provide an official letter from their eligible school stating their name and current enrollment status. Adobe Student and Teacher Edition products may be used only on your privately owned computer and may not be resold.